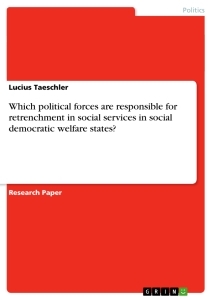 Which political forces are responsible for retrenchment in social services in social democratic welfare states? - The liberal welfare state is characterized by a low level of public social services. In this type, the private insurances play an important role thus that social rights are attached to performance on the labor mar­ket. Along with the USA and Britain, Esping-Andersen also accounts Switzerland to this type. - The conservative welfare state is characterized through particular cor­poratism and unwillingness to alter the status and class structure. An­other feature of this type is that it favors a social policy that privileges and preserves the family. - The social democratic welfare state finally is seen as the most uni­versal one. In the Scandinavian countries, public spending for social services is the highest in the world. That results in a high degree of de-commodification and a low one in stratification. Although most political scientist accepted this typology in general, there exist some critics and proposals for a modification. In showing up the weak­ness of the conservative welfare state, Kees van Kersbergen (1995) points out that not only social democratic parties, but also christian democrats were very influencing in creating the welfare states of the conservative type. Another critic comes from Manow (2002) who figures out that the Esping- Andersens typology is too generalizing and that especially the different con­fessions (protestant, catholic, lutheran) are important variables to explain the differences of welfare states. A new impact to welfare state research was given by the crisis and the re­sulting, far-reaching changes during the past two decades. Not only the development and extension of the welfare state, but also the retrenchment became a topic of theorists and researchers. There exist a lot of explana­tions about the reasons of the crisis of the welfare state: globalization and the liberalization of the economy, heavily state-debts and the ageing society were some of the most dominant. Which political forces are responsible for retrenchment in social services in social democratic welfare states? The crisis of the welfare state brought also new challenges for political sci­entists: instead of explaining the different degrees of extensions, some of them focused in their research to search for explanations for retrenchment. Most of the discussions still base on the typology of Esping-Andersen. In the liberal welfare states, the ”New Right”-governments under Thatcher and Reagan largely failed in their attempts to dismantle the welfare state, but substantial retrenchment occurred nonetheless (Pierson 2004), while politi­cal scientists don’t agree on the question whether the reforms in the social democrat welfare state also failed. Without doubt, there were a lot of re­forms to save the social democratic welfare state. But the question whether they could maintain the high standards or they didn’t should not be my primary interest. I’ll focus on how these cutbacks were realized. Special attention in the research of politic of retrenchment gained the con­cepts path dependency and increasing returns (Pierson 2000). But also here, there are different explanations. Pierson (1994) argues for example that, due to the fact that it’s not popular to cut services because it’s provokes public opposition, politics of retrenchment are very different from the dynamics of welfare state expansion. According to him, these feedback effects of previous policies, rather than the influence of political parties, social movements, and labor organizations, are the crucial variable for eplaining the institutional resistance of welfare states to change. Anderson (2001) answers that this might be true in the case of liberal welfare states (Pierson analyzed the UK and the USA), but shows that in social democratic welfare systems, unions and the social democratic parties still are the main influence. I’ll follow the argumentation of Anderson (2001) and analyze the reforms of the Swedish welfare state in the 1990s with special attention to political parties. But since I try to explain this development using the ideas of his­torical institutionalism, I’ll on the same time, focus on the concept of path dependency and feedbacks. Like that, I try to demonstrate that historical institutionalism and especially path dependency and feedbacks indeed are useful concepts to analyze politics of retrenchment. - Sociological Institutionalism (SCI), which focuses on how interests, ra­tionalities and information are socially constructed within institutional frameworks. This new institutionalism is developed from the ”old” institutionalism, which has been criticized to be deeply normative, too formalistic and legalistic and too descriptive. These critics were first formulated by representatives from the behavioral approach. They argued in the 1960s and 1970s to shift the focus of political science from formal political institutions to empirical stud­ies of the causal effects of attitudes and behaviors. The problem that faced this approach was that it could explain the behavior, which led to the polit­ical outcomes, but it was not able to explain differences of these outcomes when compared with other cases. They couldn’t embed this behavior in an institutional framework. An intervention by an individual or collective agency which is motivated by a conscious or unconscious desire to achieve some­thing. Intentional actions are political in so far as they involve decisions between inchoate possibilities for how to organize so­cial relations. Intentional political actions take place in an in­stitutional context that is defined in terms of the rule-governed practices that are taken for granted by the political actors. Theorists of all the three perspectives agree with this definition of intentional action. Their difference lies in how to define institutions and how they influence these actions. Normative constructs that are often inherited from the past. They consist of formal and informal rules, norms etc. compli­ance and enforcement procedures, and a common normative and ideological structure. Another important point in the historical institutionalism is the presence of asymmetric power, which ultimately resolves conflicts between collective actors within the institutions. The institutional distribution of power can favor some actors while disadvantage others. From this point of view, one can see institutions as a ’political opportunity structure”. When it comes to the question which level the historical institutionalism an­alyzes, no clear answer can be given. Indeed, the approach doesn’t present universal theories on the macro-level as the rational choice theory. If it comes to the level, HI researchers have eclectical approaches: While some tend to emphasize the macro-level (for example Immergut 1992), others make com­binations of micro- and macro-level analyzes. After having emphasized the differences between the rational choice and the historical institutionalism (Thelen and Steinmo 1992:7-10), Thelen (1999) critizises these differences in a later work. She argues, that during the 1990s, several political scientists worked in an eclectical way. The main difference between these two approaches lies now in the relative centrality of ’’equilib­rium order” in the RCI versus the ’’historical process” in the HI. For many researchers the central point in historical institutionalism is the emphasis on the historical process. This is taken into account in the concept of path dependency. Even if also the two other perspectives respected this idea and use it, it’s a core issue for HI theorists. Path dependency is a concept, which was originally used in economics, seek­ing to understand technological trajectories. It takes into account that the consequence of a cause is depending on a bigger context. The past influences thus the present - ’’history matters”. As the economic model was, according to Thelen (1999:385) to deterministic and to voluntaristic, political scientist developed the concept and made it more suitable for social sciences. - Distributional effects, according to these new frameworks of institu­tions re-distribute power among the actors, which favors some of them, while systematically marginalizes others. ...a relatively entrenched way of unifying, organizing, and reg­ulating a certain policy field (...) It forms a discursive terrain in which the objects of regulation, the regulatory agencies and the institutional forms of regulation mutually constitute each other. According to him, this path is formed through a complex interaction be­tween deliberate design, long-lasting traditions, learning processes and ”a chance discoveries” (2001:287). This path is structured by institutions and facilitates, but doesn’t guarantee, the reproduction of certain types of so­cial, economic or political relations. Reforms can occur, if the institutional framework has been destabilized and weakened. The dislocation of a pol­icy path is thus the condition for its transformation. One reason of such a structural crisis can for example be an exogenous event. But as policy paths have certain elasticity, they can adapt to most of these critical situations - so no critical juncture will happen. The possibility of institutional reform is not only depending on the dislocation but also to institutional features of the old path, which can help to explain why some policy paths are more susceptible to change than others. Torfing (2001:288) summarizes, that ’’in­stitutional reform is facilitated by a complex interplay of internal sources of instability and external events that dislocate the structured coherence of the policy path”. Once a new policy path is established, it will be shaped and influenced by the old one. The new path thereby shapes the strategies of the different actors, which have to adopt the changes in their goals. The re-formulation of policy-strategies is thus also depending on the old paths, which brings the consequence that radical changes are hardly possible - also due to the fact that even if the structured coherence of the policy path may have bro­ken down, many institutional regulations and normative structures remain relatively intact and still influence the new path. - Contingency. Relatively small events, if they occur at the right mo­ment, can have large and enduring consequences. - A critical role for timing and sequencing. In increasing returns pro­cesses, when an event occurs may be crucial. Because earlier parts of a sequence matter much more than latter parts, an event that happens ”too late” may have no effect, although it might have been of great consequence if the timing had been different. - Inertia. Once an increasing returns process is established, positive feedback may lead to a single equilibrium. This equilibrium will in turn be resistant to change. After the general introduction of the HI-approach with some of its core ideas, I’ll turn now to the more concrete section and conceptualize the term retrenchment. As mentioned above, this is (compared with for example the extension of the welfare state) a relatively new topic in political science. It aims to explain reasons, functions and results of retrenchments in several welfare states in the last two decades. This section bases mainly on articles from Kitschelt (2001) and Pierson (2001b). Kitschelt (2001) is arguing from a rational choice rather point of view, trying to conceptualize and formalize the party competition. After the presentation of his abstract model, I’ll turn to Pierson (2001b), who brings the whole topic back again in the context of historical institutionalism and ties it with concepts like path dependency and feedbacks. Kitschelt (2001) emphazises the role of party competition when it comes to retrenchment. He argues that ”...the stragetic configuration of party systems, net of public opinion on social policy reforms, is a critical force that shapes social policy reform programmes and their implementation ”. Before he starts modeling the different configurations, he figures out the incentives for politicians to pursue unpopular policies, to which belong also retrenchments. To do so, he paints first a restrictive model of party competition. Referring mainly to rational-choice authors such as Downs (1957), he explains the logic of the median voter theorem in a multi-party system. Retrenchment in social policy can only take place if the median voter withdraws support from social policy programmes. The party that controls the median voter also tends to be the policy dictator of the entire coalition, because no majority is viable that does not include that party. If the median voter opposes social policy reform, then the party representing that voter will do likewise and no government will be able to pass social reform (Kitschelt 2001:268). - The theory does not take into account how coalition policy is strate­gically conditioned by the policy alternatives which are offered by the opposition parties. - The parties are determined according to typical characteristics of the party families (f.e. social democratic or liberal), without taking into account differences caused by the status in the government or opposi­tion. With this very abstract and theoretical model in the background, I turn now to the incentives for politicians to promote retrenchment. Especially specific universalist social policy programmes like health care and retirement have a strong public popularity. From Social Citizenship towards a European Welfare State - A vague concept as a driving force? Does Politic Decentralization in Switzerland Strengthen Social Capital? Which political qualities enabled Churchill's 'success' as wartime Prime Minister? Is globalization causing the decline of the nation-state? Is further welfare state retrenchment likely in the UK?